RORY McIlroy has become an ambassador for fitness and men's health, but it doesn't stop him 'doing as the Romans do' when in California's renowned Napa Valley wine region. AUSTRALIAN golf, meet the new Jarrod Lyle. He’s lean, he’s keen and he’s made a solid return to the US PGA Tour at the Frys.Com Open this morning. Watch Jarrod Lyle and his playing partner both hole out for eagle. THE 2015/16 US PGA Tour season is already underway, with the opening round of the Frys.com Open teeing off in California this morning. VIDEO: Golf is an emotional sport, and winning brings that emotion to the fore with even the most reserved personalities. 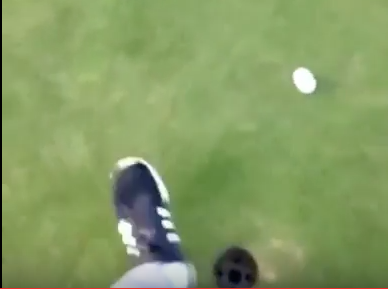 WATCH: What do you do when your mate has his first ever putt for an eagle? Kick it off the green as it looks to be curling into the hole, apparently. VIDEO: Irish winger Luke Fitzgerald is a talented rugby union player, but his skills do not translate to the golf course. THE 2015 Australian Open has bolstered its star-studded field with the announcement Lee Westwood and Darren Clarke will tee it up at The Australian Golf Club in November. WE knew Jason Day was tough, but in a tell-all interview the recent world No.1-ranked golfer revealed how he suffered ongoing abuse as a child at the hands of his later father Alvin.